MFM FC started their debut season in the NPFL with an away win at Nasarawa United and continued with yet another home win against Rivers United, their third match was at 3SC and it looked more like the Olukoya Boys will pick at least a point. postponed because the Nigerian champions are preparing for a CAF Champions League match. After the long wait then came high flying MFM FC but a name 'Wasiu Jimoh' decided to give the Olukoya Boys a welcome party to the NPFL with a hat-trick, the match ended 3SC 3-0 MFM FC. Nasarawa United may have been condemned to lose against Generation Foot of Senegal who lost 2-1 in Abuja but some how the Solid Minners managed by Kabir Dogo played out a barren draw to qualify for the next round of Caf Confederation Cup. That's their first loss at the Godswill Akpabio stadium, Uyo; Akwa United had left Congo Brazzaville win a Lone Goal victory but failed to finish up at beautiful Nest of champions stadium as VC Mokanda also won by a lone goal in Nigeria. Straight into penalties and the Promse Keepers lost 5-6. That means Akwa United are out of the CAF Confederation Cup and it'll be on record that they played just two matches in their campaign on the continent. On Sunday Enyimba FC recorded their first win on the continent this year after the highest goal scorer in the NPFL. Mfon Udoh got a brace to help the People's Elephant beat Vipers of Uganda (Aggr. 2-1) to progress to the next round of the CAF Champions League. As much as Ikorodu United deserve some commendation it's important that they know for a fact that the fans are very important to the growth of a club. Some fans turned back because of the stress to get into the Onikan stadium, it happened in their first home match and it happened again on Sunday. 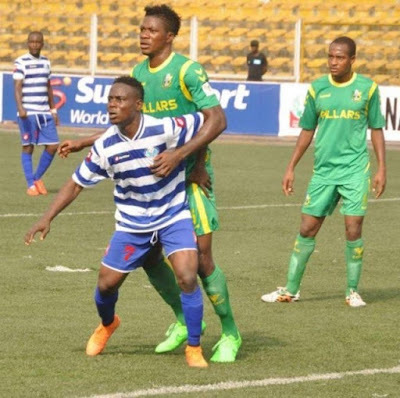 Abia Warriors recorded their first away win this season and the league's fifth after week three. *MFM FC fans won't like to remember this* Wasiu Jimoh got the first hat-trick of the season.